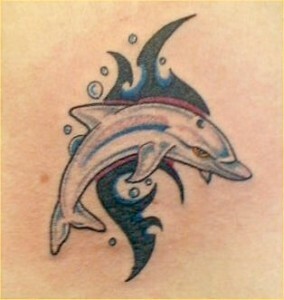 resents light and so dolphin tattoos will convey higher thought, and an illumined life. As an associate of Apollo the dolphin will also have kingly traits like: Strength, Power and Authority. We also see these themes in the dolphin’s association with Poseidon. Indeed, the Greeks dubbed the dolphin as the “King of the Sea” and with this moniker, kingly attributes will also apply to the dolphin.